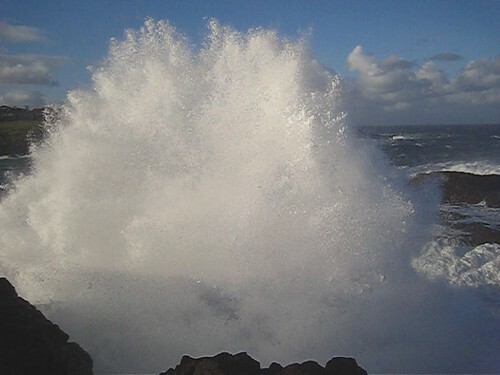 Here is some links to where Kiama is and its local heritage. Kiama is in the Illawarra, on the South Coast of New South Wales, in Australia. It is a place of volanic rock and soil, where the high escarpment (mountain range) traps all the rain coming in form the Tasman Sea and keeping hte centre of Australia dry. One of our special trees is the Illawarra Flame Tree which has leaves that get this colour only once every seven years, and it really is that bright and can be seen for miles and even kilometres! I will be posting some more information on our unique plants and animals soon. to the dense rainforest near the Minnamurra Falls. We had a world record tiger shark and world record marlin caught of the Kiama coast in 1938, the shark nicknamed Big Ben! 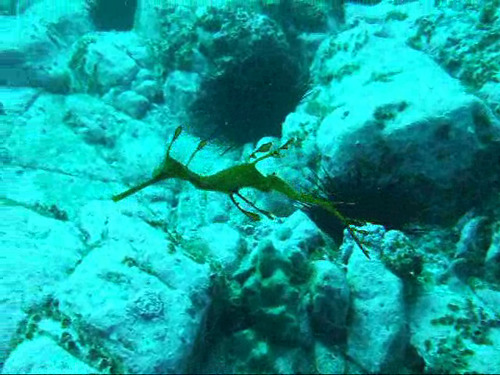 Check out billunder’s video of a weedy sea dragon at Kiama here! doing its thing. Pretty Impressive! This was photographed by ‘evita’ at redbubble. Hello to our fans in Omaha. The Temperance Societies and Bands of Hope of Australia. The festive hall has rung. By water from the spring. As water from the spring. Is barmaid to a pub-li-can at Woolloomooloo. Than pretty little Susan of Woolloomooloo. To have a ride gratis to Woolloomooloo. And we’re going to be mar-ri-ed at Woolloomooloo. All through pretty Susan of Woolloomooloo. Here is an account of a evangelical visit to Kama of the American female evangelist Miss Isabella Leonard on behalf of the Methodist Holiness Association in 1884. She was invited by the Premier of NSW Sir Joseph Carruthers, who was form Kiama and aligned to the tempereance movement politicaly. Another mention of Methodist revival, with it hysterical overtone is here. 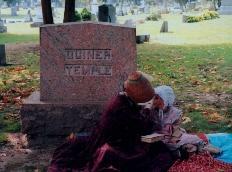 Talking Spirits at Kiama and Kendall Cemetery for Anniversary? Pinching innovative ideas from other cultures is a well-established path to success, and I am not afraid to suggest we have, as part of the Kiama Council 150th anniversary, a ‘Talking Spirits’ display at the Kiama and Kendalls Cemeteries. Join us for the tenth annual Talking Spirits: Forest Hill Cemetery Tour, held at beautiful Forest Hill Cemetery, 1 Speedway Road, in Madison. This award-winning living history program illuminates the lives of many prominent – and lesser known – figures in Wisconsin history. 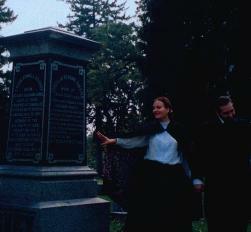 Focusing on the contributions of Wisconsin’s Civil War veterans as well as those individuals who supported the war effort at home and elsewhere, local actors and actresses don period dress, giving visitors the once-in-a-lifetime experience of meeting these characters on the cemetery grounds. Tour guides will lead informative discussions of the cemetery’s rich history and gravestone art interspersed among the vignettes. For school group reservations or more information contact: Jennifer Carlson (608) 264-6086.
autumn day — the temperature reached a record 85F, making it seem more like the ‘dogs days of summer’ than a month before Halloween. If not for the cool shade of trees planted more than a century ago, it would have made the seventh annual “Talking Spirits” tour unbearable. “Talking Spirits” is a living history event at Forest Hill Cemetery in Madison sponsored by the Wisconsin Veterans Museum. During the two-hour walk through the ancient cemetery, guides tell about the cemetery and city’s history, point out interesting headstones as well as those of prominent Madisonians, and explain the significance of different styles and design elements used in the many stones. Along the way visitors meet a variety of “spirits” who tell their personal stories and experiences during different wars in American history. Earlier residents of Madison were buried in various locations and small churchyard cemeteries around the city. Within only a few years it was obvious that a larger plot was needed to meet the needs of a growing city, and land was puchased 2-1/2 miles west of the city in March 1858. Bodies were removed from different locales around town, as well as the village cemetery, beginning in September 1859. Though burials continued at the old village cemetery until June 1866, all were eventually removed and the site of the original village cemetery then became Orton Park. Forest Hill now covers about 140 acres and contains more than 32,000 graves. The cemetery is now considered to be nearly full, however, original land agreements indicate that they may have the option of annexing land from the neighboring golf course. Around the turn of the century, families frequently packed picnic lunches and rode the trolley out to the cemetery on Sundays, srolling through the peaceful setting, thinking about the past and future, and keeping a little bit of history alive for themselves. Today, there are benches scattered throughout the cemetery as a means of encouraging people to enjoy the parklike setting. Perhaps not a locale most would choose to walk or sit, or even enjoy a picnic linch, but it does have the advantage of few (living) people to distract or interrupt, and is quite peaceful despite the heavy traffic roaring down Speedway Road. 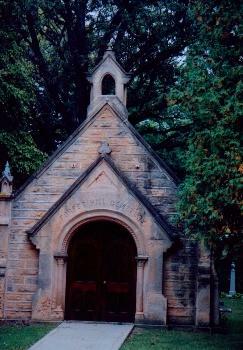 The tour began at the Catlin Chapel, which sits just inside the main gates and was donated to the cemetery by the family of John Catlin in 1878. 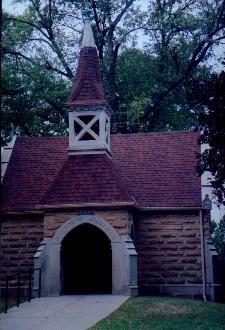 The chapel is quite small, with a tiny pulpit only a few paces across from the door, and three rows of pews on either side, facing the center of the chapel. Across from the chapel is the old Receiving Vault, which was used to store coffins over winter months, back before they had machines to dig the graves. It is no longer used in this capacity, but may still be used for storage. We then began our walk through the grounds, our guide stopping now and then to point out the marker of a famous Madisonian – Vilas, Atwood, Babcock – or interesting headstone. There is a wide variety in style and design employed in the cemetery’s headstones. Many go for a more “traditional” look, or a flat marker laid atop their resting spot; others use natural influence or sport an art deco design. I tried to get pictures of the different “spirits,” but it was difficult to do amid the crowd and so I am missing two of the actors. A third was absent due to illness. Our first stop on this year’s tour was the marker of Governor Louis Harvey (1820-1862) and wife Cordelia Harvey Chester (1824-1895). Harvey was the seventh governor of Wisconsin, and in April of 1862, traveled south to view troops following the Battle of Shiloh. It was on the return trip that he slipped on the deck of his steamboat, fell overboard, and drowned. Not at all an illustrious way to go. He was appalled at the conditions he found and said as much in his final letter to his wife, which she received a week after his death. 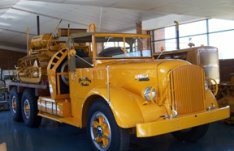 It would be interesting to see if this Kiama Quarry Olympics idea ever gets up, whether we could have a display of these trucks and other equipment there, like the Coal Olympics at Mt Kembla. The idea is essentially to revive the old quarryiing skills of knapping and spalling hammers, and other traditional quarry skills. The Boral history ‘From the Ground Up’ is a wonderfully comprehensive view of the company’s involvement in blue metal quarries ( as BMI< Blue Metal Industries) over 60 years. Anyone interested in a working steam navvy, in Alcatraz, should check out this working steam navvy. It is a 1940's vintage American R-32 whirly on a 52' x 110' barge. Some of the wackier steam power ideas through the years ( including a steam tank, 1904!) can be found here. Here is a Ruston steam Navvy in Bombo quarry in 1926.